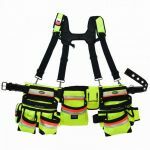 The star of the Bucket Boss Ballistic product line is the Ballistic Suspension Tool Belt Rig. 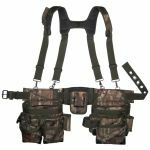 This rig is made of Cordura ballistic fabric which is a double-interwoven nylon and that means not much is going to cut, tear or puncture its way through the material. There is a lot more to like about this rig, as well. 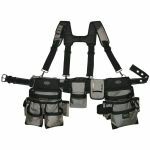 There are super capacity pouches which are adjustable on the belt and held in place with Velcro. 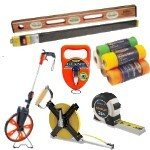 The belt fits waists up to 52" and has a steel roller buckle with monster grommets. 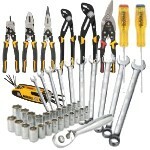 Equipped with two hammer loops and one of the pouches has a speed square pocket. 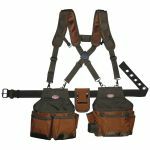 The adjustable suspension has Load Bear stretch suspension to take some of the load off your shoulders and back. It even has a cellphone holder, which accommodates the iPhone 5, on one of the suspenders. Steel buckle belt with monster grommets, fits waists up to 52"